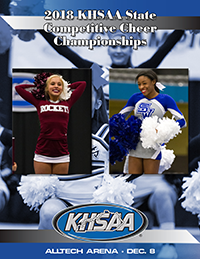 The mandatory online KHSAA Rules Clinic for the sport-activity of Competitive Cheer is now online for all coaches (head and assistant) and licensed judges (officials). August 4 to September 1 (Officials) – the Competitive Cheer Clinic will be online only and may be viewed at no charge during this period. August 4 to September 7 (Coaches) – the Competitive Cheer Clinic will be online only and may be viewed at no charge during this period. September 2 to September 28 (Officials) – the Competitive Cheer Clinic will be online only and may be viewed for the makeup fee ($100) during this period. September 8 to October 5 (Coaches) – the Competitive Cheer Clinic will be online only and may be viewed for the makeup fee ($100) during this period. September 29 to October 24 (Officials) – the Competitive Cheer Clinic will be online only and may be viewed for the makeup fee ($300) per the Bylaw 27 schedule during this period. After this time, postseason penalties per Bylaw 27 will apply. October 6 to October 24 (Coaches) – the Competitive Cheer Clinic will be online only and may be viewed for the makeup fee ($300) per the Bylaw 27 schedule during this period. After this time, postseason penalties per Bylaw 27 will apply.